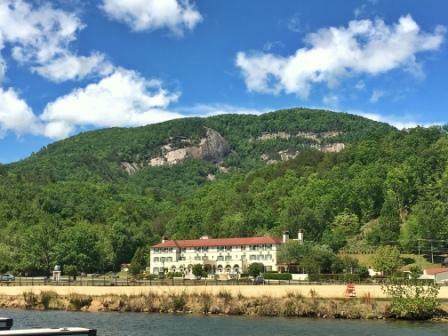 Boasting 90 years of history, our charming hotel is surrounded by the Blue Ridge Mountains and just steps from beautiful Lake Lure. The Inn combines historical elements with the most modern comforts making it the ideal location for guests seeking leisure or those visiting for business. Just 25 miles southeast of Asheville, NC, our hotel is the perfect place from which to explore neighboring areas or enjoy a relaxed setting in the heart of Lake Lure. The Inn offers well-appointed accommodations, panoramic mountain views, dazzling wedding venues, and exceptional banquet facilities. The Veranda Restaurant serves fine dining fare prepared by our Executive Chef which can be enjoyed inside or outside on the terrace. Our on-site lounge, the Moose & Goose, is the ideal spot for a light meal, conversation, and cocktails. If total relaxation is on the agenda, visit the Iron Gate Spa for a variety of services in state of the art treatment rooms. 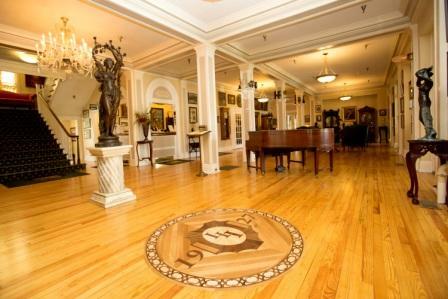 Thank you for choosing The 1927 Lake Lure Inn and Spa for your recent stay in Lake Lure. We’d be grateful if you would review us on TripAdvisor. It’s the world’s largest travel site, helping millions of visitors every month plan the perfect trip. Our guests often tell us how helpful it is to read past guests' reviews before booking their own visits. And we're always eager to hear what you liked and how we can improve. Thanks again, and we hope you'll choose The 1927 Lake Lure Inn and Spa the next time you're in Lake Lure! Just 25 miles southeast of Asheville, NC, our hotel is the perfect place from which to explore neighboring areas or enjoy a relaxed setting in the heart of Lake Lure.